Since Blender 2.0 - 'gameBlender' - was just around the corner, NaN added the UV texturing tool to the blender 1.x series to enable users "prepare" themselves for game content creation, by practicing UV texturing along with low-polygon count modeling. This tutorial was written for 1.8, but everything still works the same in 2.0. Well, there might have been some confusion about the UV texturing, since Ton suggested to me today, that I should write a UV texturing tutorial :o) Here it is! We start with the finished object and the image window opened. 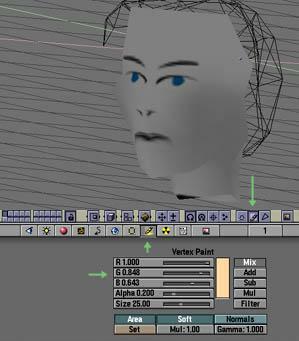 You will start off with a file you created your model in (be it a face, character, vehicle or whatever). Once loaded, you will need two windows to work efficiently - the 3D window ( ) and the image window ( ). The 3D window will represent your model, while the image window will show your textures and allow you manipulating the UV coordinates. The green arrows indicate the buttons that tell you the type of the window, the left being your 3D and the right your image window. You can download an example .blend file fot the face here. With your object selected go into face select mode. The key to UV texturing is the face select mode ( ), where you tell Blender which faces' UV coordinates to use. The arrows show the current active (and selected) face - left, the icon for face-select mode - middle, and the representation of the face in your image space - right. You can select faces with the right mouse button. Holding down shift while clicking with the mouse allows you to add more faces to your selection or deselect some, without affecting the state of other faces, that not accessed with the mouse. You can basically use the same selection techniques as you do in your everyday Blender work. 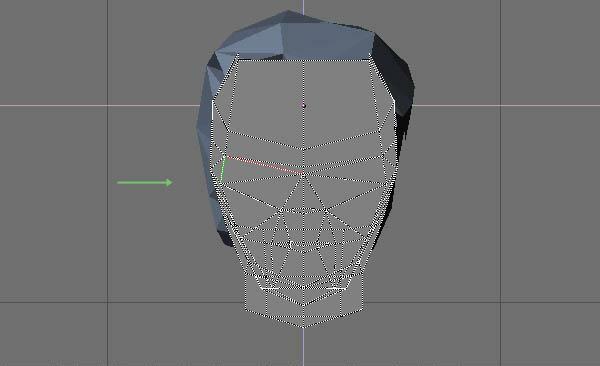 However we do want to map our whole face model and instead of selecting each face, we select all by pressing . However, a face must be selected before that anyway, to appear "active" (see the green arrow), as some other face attributes must have a origin - the active face. Load an image in the image window. This is due to the way OpenGL handles textures; you could use a texture with its height and width not being the same, however most OpenGL hardware (especially games adapters) will then stretch the texture to fit in their memory. Once you have your faces selected, you need to load their UV coordinates into the image window. To do so, you need to press and choose one of the options presented to you. I chose "From Window" - that used the 3d window to map the UV coordinates - hence, the image window contained a "front" view of the objects' coordinates. You can now move the vertices in the image window to adjust mapping. You need to turn on the textured view (left green arrow) now, in order to see the adjustments of the UV coordinates you perform (right arrows). This should give you the first UV texturing results. 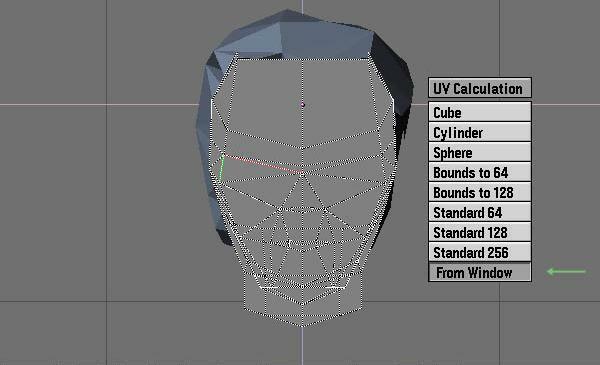 Editing the UV coordinates works the same way as editing normal vertices in edit mode. You can play around by selecting a group of the UV coordinates and scaling, rotating or moving them. However, you might soon find yourself in a situation, where you are not sure what impact your UV editing actions have - feel free to rotate the 3D view, zoom it in and out etc. You can also move and zoom the image windows, allowing very detailed mapping work. Go to vertex paint mode. Once we have out textures in place, our friend still looks kind of sick - lain gray is no color for a face! Exit face select mode by pressing f and enter vertex paint mode by pressing or clicking the button indicated by the right arrow. The other arrows indicate the vertex paint buttons button (funny, eh?) and the sliders to choose the right colors. While in vertex-paint mode, your left mouse button lets you paint on object, while your right mouse button (thanks, Rob!) lets you choose colors beneath the mouse cursor. I tried to get a skin-like color and just painted away. After finishing with vertex painting, we can enjoy our new-textured head. It looks very clean and nice with black hair, however I added a "hair" pattern sort of on top of my face texture and you can use it..
Repeat the same for the hair and enjoy the result. I hope this little tutorial was helpful.